With the recent commencement of the building of the “Statue of Unity”, a statue of Sardar Vallabhai Patel, which at a proposed height of 182m is set to be the largest statue in the world, the question is being debated over who is the best carrier of his legacy: The Congress or the BJP? The statue is the brainchild of the BJP, and the Congress is saying that the Sardar wouldn’t have appreciated the BJP trying to appropriate his legacy. One obvious fact to consider is that Sardar Patel was himself a member of the Congress. However this in itself doesn’t necessarily mean much; the Congress over its life has changed its aims and ideologies many times, and this is reflected through its very broad range of membership through different periods since its birth in 1885. If we look at the Congress of 2013 it is likely that some of the dominant members of the Congress of the past would not approve of it and would either try to transform it, or would work through alternative political parties (or even shun politics!). To illustrate the changes within the Congress over its history, we can go back to its very beginning. It was actually founded by a British Civil servant named Allan Hume, and it was envisaged to be a platform of educated Indians to have a dialogue with the British Empire and to exert greater influence over British policy in India. It started of very docile, with rich, educated and often Anglicised Indians forming the bulk of its membership. However with the rise of Nationalist spirit in India, there was a struggle in the Congress. There was a “moderate faction” led by Gopal Krishna Gokhale, and a Nationalist faction led by Lokmanya Tilak, the latter wanting full Independence. The relationship between these factions was quite strained until Gokhale’s death. Over time the Nationalist ideology became the dominant force within the Congress. The Congress during this period attracted diverse membership which included some great luminaries, such as Sri Aurobindo, Lala Lajpat Rai and later of course Mahatma Gandhi, Subhashchandra Bose and Sardar Patel. There was always a struggle for ideology within the Congress. There were people who wanted to push Congress towards a socialist / communist path, some who would prefer capitalism and a closer alignment with the West. Some espoused a Hindu / Dharmic ethos for India, and visualised India as a Guru for the world; other were anti-religious and openly proclaimed religion to be a curse on India. There were some who believed English should be the national language, others Hindi and some Sanskrit. There was always a group within the Congress, epitomised by Jawaharlal Nehru, who were an anglicised elite, economically left leaning and espousing an aggressive (but selective) secularism. At the time, the Congress itself had a space for all of these diverse personalities. However with dominance of Nehru and the Nehruvians in the post-independence era, the other voices within the Congress were slowly but surely side-lined. With the death of Sardar Patel, who was during his life too powerful for Nehru to push around, the Congress remained representative of a wide range of viewpoints. But after the death of Patel, with nobody popular enough or powerful enough to challenge the direction of travel given by Nehru, the Congress became more and more shaped in the fashion of Nehru. There was a “Hindu space” within the Congress at one point; that is a space for people who believed that Hindu dharma should be a respected and preserved part of India’s ethos, including in the public domain. But over time, with the “aggressive and selective secularism” becoming the main approach of the Congress, and other voices became drowned out. Those who perhaps could have been part of the Congress at some point in its history found their voices increasingly submerged in the intolerant and radical secularism that the Congress came to espouse. While Sardar Patel was alive, the Somnath Mandir could be renovated and restored, Nehru was angry about it and didn’t attend, but he knew there was precious little he could really do about it. However, in the post-Sardar era, something like this could never happen. The fact is that the Congress leadership of today would be aghast and call someone all kinds of swearwords: anti-minority, rabidly communal, fascist etc. for doing something today along the lines of what Sardar did then. Would the country have been better off if Sardar Patel had been the first Prime Minister? It is quite well known and needs little repeating that within the Congress it was Sardar Patel who had a greater mandate and was assumed to be set to be India’s first Prime Minister, if it were not for Mahatma Gandhi’s intervention. For whatever reason, the Mahatma felt that Nehru was a better candidate. It is not uncommon to hear people say that India would be better off in many ways if Sardar Patel had become India’s first Prime Minister rather than Nehru. However as a counter to this, it is a fact that Sardar Patel lived for just over 3 years after Independence; it is sometimes questioned how much good he could have done in that time. My own contention is that Nehru was an unmitigated disaster for India, and that even 3 years of Sardar Patel would have given a much better start to India in some key areas of national progress. From an economic perspective, Nehru was disastrous for India. Nearly anything would have been better than Nehru’s ill-conceived policies based on flawed socialist models. India’s economy grew at a rate of only 3.5% for the first 30 years of India’s independence. Even someone who didn’t interfere too much in India in terms of economic policy and just let the people get on with enterprise without a stifling license Raj would have achieved a much faster growth. As far as national security is concerned, the Kashmir problem and the 1962 China debacle are “gifts” of Nehru to India. It is unlikely that Sardar Patel could have stopped the China debacle due to his short life, but in terms of Kashmir it has been shown by Arun Shourie (in “A Secular Agenda”) that Sardar Patel knew that a great headache was coming due to Nehru’s actions. Sardar Patel was deeply opposed to Nehru’s action of taking the matter to the UN, leaving 1/3 of the state in control of Pakistan who in turn have totally cleansed out Indian-ness (and Hindus) from their part of the state. Although these are just two examples, they do indeed show that even in 3 years, it is very likely that India would have got off to a much better start under Sardar Patel than under Nehru. Many jokers in the Indian media, who have never had any time or appreciation for Sardar Patel all their lives, are all of a sudden experts on him! They selectively quote him, dressing him up how they want to portray him. One laughable attempt to do this is seen by anti-Modi writer and self-hating Gujarati Aakar Patel, here. It is the same Aakar Patel who continuously blames Modi for the fact that there is a prohibition on alcohol in Gujarat, and uses it to try and tell young voters that life with Modi as Prime Minister would be boring and anti-youth. In fact, this prohibition on alcohol in Gujarat was in place since 1960, and was implemented to honour Mahatma Gandhi, who actually wanted a prohibition on alcohol in the entire India. Modi is aware that the prohibition is a little harsh, and has therefore made the police adopt the policy of turning a blind eye to normal people who happen to have a small amount of alcohol in their possession and are not involved in any other crime. I would advise anyone who really wants to know Sardar Patel’s thoughts about most of the issues relevant to our times to purchase the biography of Sardar Patel by Rajmohan Gandhi (Mahatma Gandhi’s grandson). It is by no means perfect, as Rajmohan Gandhi ultimately writes his book to promote and vindicate his grandfather. But it is a lively read and also an honest enough piece of scholarship to allow people to make up their own mind on Sardar’s own views. The book is available here as a free download. I am not going to comment in detail about Aakar Patel’s misleading and childish arguments, as it will make this article very boring. But I will comment on the difficult to forgive point about Sardar Patel having no knowledge of economics, and thus how could he have made India better off economically compared with Nehru? Let me say this very clearly – India economically would be have been better off under anyone (compared with Nehru), provided that India’s citizens were allowed to just “get on with it” without the thousand hard hitting barriers and licenses, instead of Nehru’s neo-communist plans which put severe hardships and handicaps in pursuing economic freedom, not to mention spawning tremendous corruption. Sardar Patel had a good understanding of India’s talents and needs. He understood the importance of entrepreneurship, avoiding policies which attempted unreasonable wealth re-distribution. He shunned radical but unproven ideologies of any sort. Narendra Modi has been a member of the RSS since his youth, and although he has at times been opposed by sections of the RSS, at the present time he enjoys the overwhelming support of the organisation. Sardar Patel banned the RSS after the assassination of Gandhi, for a period of one year. Thus, the logic goes, Modi has no right to appreciate Sardar Patel in this way. Now the issue of whether the RSS had anything to do with the Mahatma’s death is dealt with quite succinctly here, and I don’t have much to add to this, alongside the fact that just like the Congress changed over time, it is not necessary that the RSS is the same organisation as it was around the time of India’s Partition. Sardar Patel was positively inclined towards the RSS before the Mahatma’s assassination. He praised the role of the RSS in refugee camps during the traumatic period following independence. However, after Mahatma Gandhi’s assassination on January 30, 1948, Patel’s attitude changed. He still made a distinction between the Hindu Mahasabha – whom he blamed for the assassination – and the RSS which he banned for a year. Patel rescinded the ban after advising the RSS leadership to work on social issues, respect the Constitution and abjure politics. Regardless of all this, one has a right to appreciate and honour the memories of great personalities even if they are of different political persuasions, or have major disagreements. For example, Atal Bihari Vajpayee had great words of praise for Indira Gandhi, and Indira Gandhi in turn had some very complementary words to say in memory of Veer Savarkar. And just for the record, the author of this article is not and has never been part of the RSS or affiliated organisations; I am a Swadhyayee by background and am currently just a freelance Hindu (i.e. no organisation affiliation). 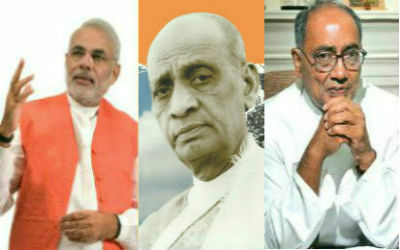 Large sections of Gujaratis have grown up with stories of the injustice of fate, which led to Nehru taking precedence over Modi, and many almost feel a personalised grievance with regards to the lack of respect and remembrance given to Sardar Patel as opposed to Nehru. To add to that, people from all regions of India who have grown up with the predominant / mainstream urban Hindu narrative of history, Nehru is thought of as an undeserving, spoilt brat – weak towards those to whom he should be strong, a bully towards those who should be protecting, intellectually mediocre, and having laid the worse possible start for India in almost every way imaginable. Sardar Patel is respected by all as a strong man. To glimpse this narrative at its best, check the following piece by the late Sita Ram Goel, a non-Sangh Hindu writer: The Nightmare of Nehruism. Modi is both Gujarati, and is from the Hindu nationalist fold. He cannot but hate Nehru and love Sardar Patel. This isn’t just him trying to fool people, this is from his heart, and he has been saying this for many years. What would Sardar Patel have thought about today’s Congress & BJP? It is only hypothetical to consider what the Sardar would have thought of the Congress Party and BJP of today, and which party he would have preferred. It is a difficult question to attempt to answer, and arguments can be made both ways. My own view is that neither party can accurately claim his legacy. But it is a fact that the memory of Sardar Patel has not been given the honour and prominence it deserved by the Congress Party. There has been a systematic effort to promote the Nehru-Gandhi dynasty with comparative side-lining of Sardar Patel (amongst others). No matter who is initiating an effort to honour the legacy of the man who united India, it is on the whole a good thing . I am not altogether convinced, however, as to whether a huge and costly statue is really the best way to honour Sardar Patel and what he stood for. At a time like this when the unity and security of India is under severe threat, the Rs 2500 Crore may be better spent in having an impeccable book about the great leader authored and published in several languages and then distributed by volunteers to virtually every home in India. It is a sad fact that the BJP and Sangh have (with a few noble exceptions) always tended towards resorting to symbolic gestures rather than the more important and decisive issue of raising awareness and intellectual clarity among the masses. …I can trust nobody who wants more representation for his community at the cost of the other community. All nationalists must accept the principle of representation on a population basis. No device to turn a majority into a minority can be accepted under any circumstances. In our anxiety to placate the Muslim League, we have diluted nationalism to such an extent that it has almost lost its original genuine appearance. He was far more secular than Jawaharlal Nehru, although the latter was louder about his secularism. The secularism of Nehru was strange and convoluted. He for example resisted modern law code for Muslims on the grounds that they were not ready for reform or change. He thought that it is secular for millions of Indian Muslims to have state funded Hajj pilgrimage, when Muslim countries themselves do not have such schemes. He couldn’t see the implications of this for national integration, and couldn’t see that it was against true secularism, which is the absolute equality of all citizens before the state regardless of what religion one professes or whether one professes no religion. « Wishing you a happy & auspicious Diwali ! Very interesting and well written. . . .namaste. . . I entirely agree with the writer. With due respect, I only say Nehru’s taking Kashmir issue to the UN was a blunder – India is suffering ever since – third countries are exploiting it; Economy is another blunder – industrialisation was necessary neglecting cottage industries, artisanship, craftsmanship and agriculture cannot be justified as India is and was dependent on agriculture. Very usefull information about congress, its so cslled secularism, nehru’s idiology and my favourite leader Sardar Patel Jee . Thanks a lot.